This system allows for VSP(vertical shot positioning) of this year's growth, and thus the maximum exposure to sunlight. There are many opinions and theories as to what will accomplish this best, but for me this is what has worked best after eight years of experimentation. 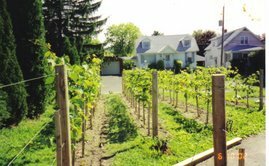 The French have also made quality wines in this way for hundreds of years and many vineyards here in USA use the same method. 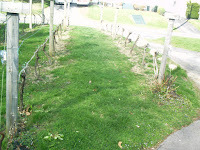 Each vineyard though, must experiment and come up with the best system for your individual scenario. The buds are very swollen and about to break, budbdreak is arriving a bit late this year due to a cool spring. The forecast is calling for lot's of sunshine and warm temps for the upcoming week and this should get things rolling! It's a very exciting time of the year for a grower. 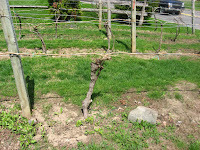 The first variety to break bud in my vineyard is the French-American hybrid Marechal Foch. 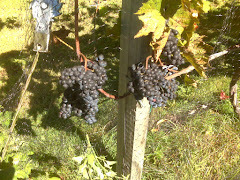 Followed closely by my Vinifera varieties Cabernet Franc and Riesling. My most recent addition, a German variety called Regent will be making it's first budbreak for me this year, so we shall see when it happens. I'll be adding some pictures of budbreak and early growth in the next week or so. We're off and running toward another vintage, hopefully a great one! Hey, just ran across your blog. I hope you don't stop posting. I noticed your last post was in may. It takes awhile to establish a good blog, and for people to find you. I look forward to your future posts.